The Photoshop controversy begins again. 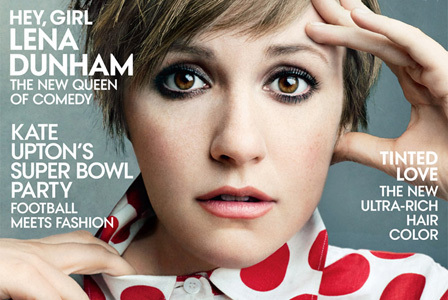 How could Vogue magazine manipulate Lena Dunham into a size zero courtesy of Photoshop? Oh wait, they didn’t. After Jezebel published the unedited Vogue images of Lena Dunham, women have made it clear how they feel about what Vogue did to their beloved Girls star. They don’t like it. They’re offended. Period. But let me ask you this: How is what Vogue did any different than what you do to your selfies on Instagram every day? Now, I don’t feel that young girls and women should accept filtered photos as reality. However, maybe the real issue in this particular instance is that somewhere along the way someone forgot that Vogue isn’t reality. It’s not edited to represent the everyday. It’s fashion in its most extreme, most imaginary form and being on the cover means playing dress up for a day to become a part of that art. As Lena said in her own defense, “A fashion magazine is like a beautiful fantasy.” Wouldn’t you live a fantasy for a day? If Vogue had cropped Lena’s head on to a Victoria’s Secret size body, I might be screaming with you Jezebel. But they didn’t. While I do feel that our society has a problematic view of beauty and we should focus on ‘beautiful’ as something ultimately driven by who we are inside, not on the outside, these photoshopped images of Lena Dunham just don’t skew my view on beauty. Vogue may overdo their Photoshop work on other occasions and the generation of selfie editing may be out of control, but here, Dunham looks like she’s dressed in clothes for the average size woman. Her body shape, her weight and her appearance don’t look unrealistic. The only thing unattainable about these images is the fact that I could never afford those feathers she’s wearing. I’m sure the intent behind the scandal Jezebel has created did stem from somewhere meaningful, but I just wonder if these feminist efforts would be better left for the more dramatically photoshopped images that actually cut dress sizes in half, the ones who aren’t of a woman fighting alongside us to remind girls that you’re not supposed to have a twig for a body. Considering Dunham’s candid lifestyle, I don’t think Vogue was trying to fool anyone here. If the edited photos reveal anything, it’s that we live in a digital age with digital images, and Lena Dunham still looks nothing like Kate Moss. So, while we wait for the next episode of Girls, can we all turn the page and pick on the fashion ad featuring skin and bones instead? It might not generate as many page views or as much ad revenue, but at least it carries a more plausible argument against unrealistic body image.